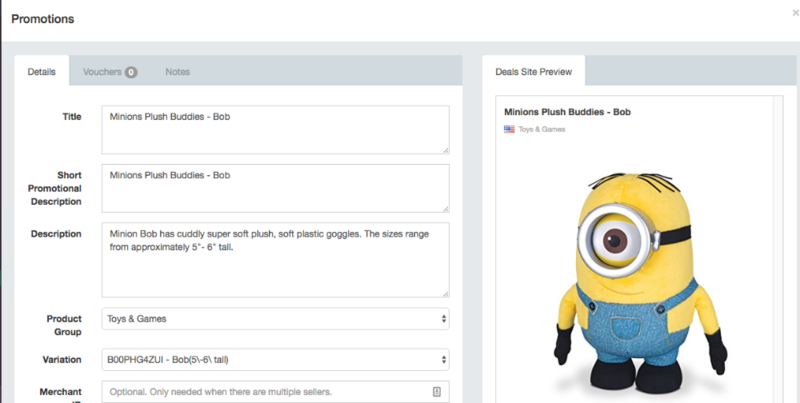 We have recently added a new feature to AMZ Tracker, making it easier to add products to your 'Promotions' tab. In the 'Track Your Rankings' section, you will see an icon next to the magnifying glass, or tracking icon. The new 'gift box icon' will add your product directly to the 'Promotions' tab. Before you proceed, please note: when you publish your promotion to Vipon, you can no longer edit your price within AMZ Tracker. If there is an issue, you must amend your price and then click the 'Save' button in the edit menu. This will take some time to be approved, so please take this into consideration. Go to the 'Promote on Vipon.com' tab on the left side menu. 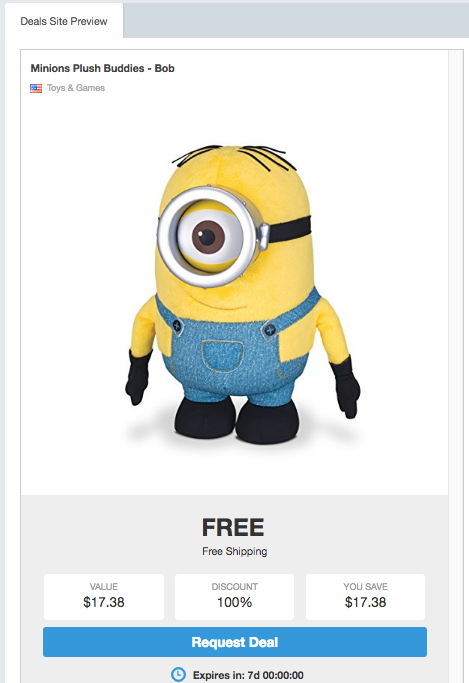 Click on the product title of the item, you want to run the promotion on. The 'Promotions' edit screen will appear. You can not change your product title, this is pulled directly from Amazon. Feel freeAdd some details about your promotion into the 'Short Promotional Description' text box. Select or update the 'Product Group' from the dropdown list. A selection should be automated based on your Amazon listing. If there are multiple sellers of your product you can enter your merchant ID to ensure the link goes to the product on your storefront. My product has multiple sellers. How can I link to mine only? The link to the product will show underneath, you can click to test the product link is working correctly. Enter a working 'Support Email' that shoppers can contact you on. We recommend that this is an email account that you check regularly. If shoppers have any trouble purchasing your product they are directed to contact you on this email. You can also include a link to a YouTube video, should you have one available. Enter a 'Start Date' from the calendar by clicking on the date. Enter a 'End Date' from the calendar by clicking on the date. Check the 'I understand about protecting my inventory. 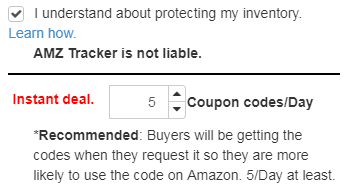 AMZ Tracker is not liable' checkbox to agree you have read and understand your liability with running a promotion. Adjust the number of coupon codes sends/Day. You must have at least 5 vouchers available per day, a campaign for 5 days will need 25 codes minimum. Original Price = The current listing price on Amazon. Discount = The amount ($ or %) off you are offering. Discounted Price = This will automatically calculate for you. 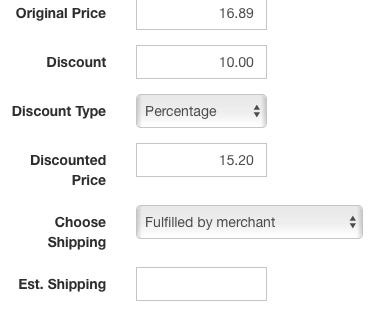 If 'Fulfilled by Merchant' enter the estimated shipping charges into the 'Est Shipping' text box. You can see more details about how to correctly add you FBM item with shipping here. 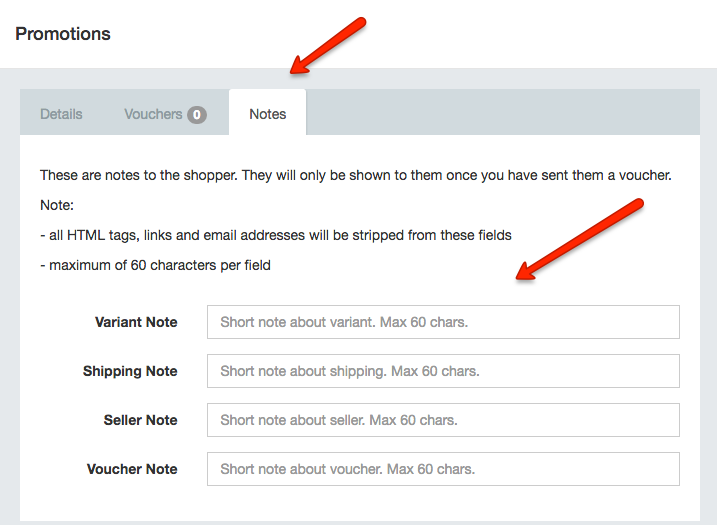 Select your voucher type by clicking on the appropriate radio button. With this option each promo code can only be used one time by one person. It prevents abuse from users sharing coupons publicly. Secondly we recommend this type of code with a dollar ($) amount off. If you choose to use a percentage (%) off code, that % if off the entire cart for 1 use, so this type of code can still be abused. Recommend $ amount off with one time use claim codes. With these promo codes ANYONE can use the code and can share the code publicly. This can cause promos to go viral causing users to run out of stock sometimes or giveaway large amounts of product for very cheap. Copy and paste your codes into the 'Vouchers' text box. Multiple, one time use claim codes Only: Be sure to leave 1 line between each code. Applicants applying to shoppers for you are limited by the number of codes available. Therefore be sure to add enough codes for the number of promotional sales you want. Remember, you must have a minimum of 5 codes per day available. A sale for 3 days will require 15 codes minimum. Shipping Note: If there is anything the shopper should be aware of about the shipping, costs, time taken etc. You can leave a short note here. Seller Note: General notes to the shopper, thank you, important information etc. Voucher Note: Notes about redeeming the voucher, time limits, expiry etc. Check that the 'Deal Site Preview' is correct with all of the right detail, title, price expiry etc. If not, return to 'Details' tab and edit the information as necessary. If so, proceed with the next step. Check that the 'Pause Listing' switch on the bottom left bar if off (grey). If it is red, please click on the switch so that it turns grey. If it is grey, please see the next step. Check the message under the switch for any error's. If it states 'Listing will be live once saved', please proceed to the next step. 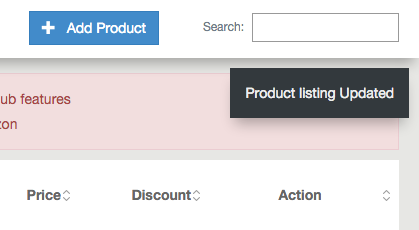 If it states anything else, then there is an error with the listing which will prevent it form going live. No vouchers - Go back to step 17. Expiry date in the past - Go back to step 12. Pause Listing checked - Go back to step 21. You will then return to the 'Promotions' tab. A note will show stating 'Product listing Updated'. If editing the price, you must wait for the change to be approved. The 'triangle' icon will now be green to signify a play button. This completes the promotion setup. Check back later to see your shopper requests. See the How to select your shoppers' section for the follow on details. When setting the link you have the option to include Merchant ID and product Variation, it's important to set these up correct to avoid issues with your link going to the wrong product or seller. "Variation" - It's common with products to have variations of that product, this could be size, color, or other differences between the products. It's important you select the correct product variation that the promotion applies to otherwise the link may go to the wrong product variation and this will cause confusion with the shopper trying to purchase the product. "Merchant ID" - If there are multiple sellers of your product you can enter your merchant ID to ensure the link goes to the product on your storefront. A common issue you might see is that if you click on the link you will see your product showing that it is "Out of Stock", this is generally because the merchant ID has been entered incorrectly. Go to the 'Promotions' tab in your AMZ dashboard. Click on the product title of the product you wish to remove. The pop-up box for the Deals Community will appear. Click on the switch to change the setting. Active = Grey means the listing is active, unless there are any issues. Below is an example of a listing which has issues so it can't become active. Expiry date in the past. Paused Listing = Red switch appears. If the price has increased. Stop your promotion for 48 hours. Then change the price. Be sure to clear away any pending requests. If the price will decrease, feel free to edit the listing immediately and offer the new rate to pending shopper requests. All price changes will need to be approved before going live, once you click save after changing the price, you will need to wait a short while. The standard temple for emailing shoppers' codes asks that they purchase within 48 hours. Therefore we ask that you honor the price that the shopper agreed to buy at and you agreed to sell at. So if the price change increases, costing the shopper more, it would be best it you stopped giving out codes for 48 hours, then change it. This allows time for those who got a code to purchase it at the agreed price when they requested to be a buyer. If the price is lower, costing the shopper less, then this would be fine to change without waiting 48 hrs, as we can't see anyone getting upset over a cheaper price. Note: Be sure to check your codes are still valid. If necessary you might need to make new codes in Amazon to match the new offer, and then add them into AMZ Tracker.